The Boudin domaine is located in La Chapelle-Vaupelteigne, one of the hamlets outside of Chablis proper, just across the Serein river from the 1er Cru vineyard of Fourchaume. 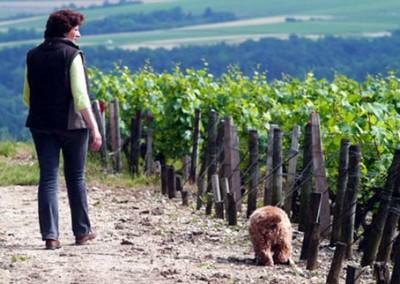 The Boudin family farms just over 11 hectares of vineyards in Chablis, including 5 in the premier cru Fourchaume. Run by Francis Boudin, Domaine Boudin is an outpost of artisanal, hand-crafted wine in a region that is dominated by negociants. Francis strives for purity and terroir-expressiveness by eschewing oak. Another distinguishing factor of Boudin's is the fact that all plantings have come from massal selections of their own Chablis vines rather than re-planting with Chardonnay clones from other areas of Burgundy, a more common practice in the region. Add to that the fact Domaine Boudin has an enviable array of holdings (including the rarest of rare 1er Cru L'Homme Mort, a south facing parcel within Fourchaume). Wine Advocate 89 "The 2015 Chablis 1Er Cru Fourchaume has a simple, fresh melon and grapefruit scented bouquet that is clean and pure, though needs to show more mineralité. The palate is balanced with a saline entry, a little serious and it just pulls up a little short on the waxy, spicy finish.